Australian comedy is going through a bit of a purple patch, with an amazing generation of young comics coming through – think Susie Youssef, the Kates, Rama Nicholas, Joel Creasey, <insert name of your favourite young Aussie comic here>. And The Travelling Sisters have well and truly reserved three places at this illustrious table. Lucy Fox, Laura Trenerry and Ell Sachs are outstanding comics in their own right, but together, they’re a powerhouse. Walking into to the Backstage room of the Town Hall, we were greeted by these three smiling performers, bedecked in Elizabethan ruffs, who welcomed us to the show. Their easy-going patter with the audience assured us that we were in safe hands. 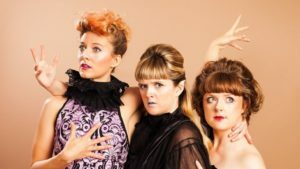 The three offer an odd combination of sketch, music, dance and physical comedy. It’s a daring brand of shtick that requires lots of trust – in each other, and of their audience. They are obviously very comfortable performing together, and generate an amazing rapport – both within the sisterhood, and also with the audience. Their material is brassy, bold and outlandish. 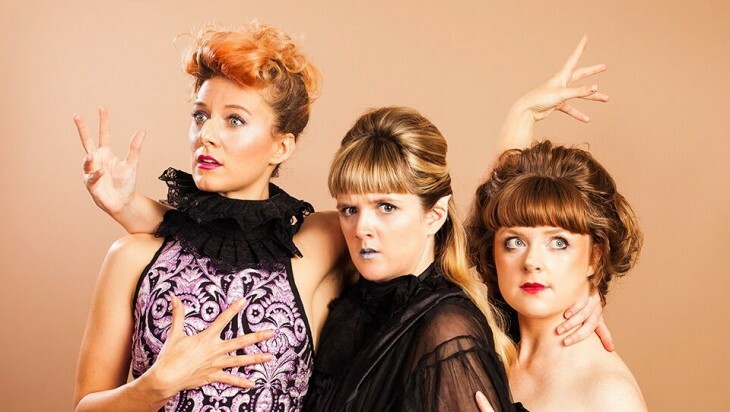 Their subject matter covers topics from dancing lollypop ladies to the perils of female gym changerooms to depressed cacti – all done with an infectious playfulness, cheekiness and an appreciation of the absurd. The audience sing-along is one of the more unusual you’re ever likely to be part of. True of all sketch comedy, some of it works better than others. Their songs are well constructed and beautifully delivered. Their individual character work is terrific – with a uniform level of OTT-ness and silliness across all three performers. One of the things that delighted me was the thought that they have put into their transitions. It’s a prop and costume heavy piece, but at no stage were the audience left sitting waiting for the next part of the performance to commence. Even the act of taking a wig out of a suitcase was given the full theatrical treatment. The recorded music underpinning the transitions is astonishing. The finale is a work of art, and worth the price of admission alone. In short, this show is a joy. If you thrive on abject silliness and abstraction across a range of disciplines, delivered by three outstanding artists, this could be the show for you.